From Dr. Chrlesworth: "Gary Rendsburg is a leading specialist on the Hebrew Bible and the world of ancient Israel, a contributor to the Foundation's JESUS AND THE TEMPLE symposium, and a member of the Princeton Dead Sea Scrolls Project. He is...(CONTINUED FROM THIS WEBSITE HOMEPAGE) an observant Jew who contributes to scholarly conferences and teaches at Rutgers University. He is a friend of the president of FJCO." Here are Rabbi Rensburg's comments about the BenSira.org website. 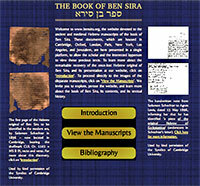 "The diverse manuscripts of the book of Ben Sira are currently housed in libraries and institutions (and in one instance a private collection) in Cambridge, Oxford, London, Paris, New York, Los Angeles, and Jerusalem. They are "ancient" (Qumran, Masada) and "medieval" (Cairo, Genizah) in source. We are pleased to announce the BenSira.org website brings together for the first time the entirety of the manuscript tradition in a convenient user-friendly format. (The folios held by the Bodleian Library, Oxford, are not yet available at our website). The first and second stages of the website include high-resolution digital images of the documents, along with transcriptions of the Cairo Genizah manuscripts, and transcriptions and translations of the Masada scroll. Future updates will include translations and/or transcriptions of the remaining material, as well as additional resources to guide the interested scholar and layperson alike. The developers of the BenSira.org website gratefully acknowledge the assistance and cooperation of the custodians of the various Ben Sira documents, all of whom are acknowledged at the Introduction page of the website. Gary A. Rendsburg and Jacob Binstein Department of Jewish Studies Rutgers University, New Brunswick, N.J., U.S.A"